What specific laws are in place? Are there alternatives to pesticides? Municipalities have the right to implement by-laws protecting public health and safety. So ruled the Supreme Court of Canada in their landmark decision upholding a by-law passed in Hudson, Quebec that banned the cosmetic use of pesticides within municipal boundaries. Buoyed by this decision, the Ontario Public Health Association (OPHA) passed a resolution at its annual general meeting urging the restriction of non-essential use of chemical pesticides on public and private lands. The meeting, which was part of OPHA’s 52nd Annual Conference, drew 500 community and public health professionals who discussed the issue of pesticide use. The resulting resolution asserts that many scientific and medical studies have demonstrated an association between pesticides and numerous health effects and therefore it is prudent for municipalities to use the precautionary principle when it comes to the use of pesticides on household lawns and public lands. Also encouraged by the Hudson case, many local health, safety and environmental activists are renewing their efforts to reduce and eventually eliminate exposures to pesticides in their workplaces and communities. As a union UFCW Canada also supports this initiative as many of our members are exposed to pesticides do to their jobs. This in turn will protect the health and safety while on the job not just for our members but for all workers, for those who work on farms, live in our communities, and play in our parks. Pesticides are substances designed to kill, injure, repel and neuter living organisms that some have determined to be pests. These pests might include insects, plants, fungi, moulds and/or rodents. The term "pesticides" refers to a wide range of products, including herbicides, insecticides and fungicides. They are available in a variety of formulations including sprays, dusts, powders, granulars, concentrates, liquids, pastes, pellets, pressurized products and tablets. There are approximately 6,000 pesticide products registered for use in Canada. Most came into the market following World War II. The World Wildlife Fund has calculated that at least 50 million kilograms of these products are used in Canada each year, at a reported value of one billion dollars a year. They are used in agriculture, in fish farming, in homes, in day cares, in parks and recreational fields, on residential lawns, on golf courses, on pets, and even on children to combat head lice. They are also used widely in industries such as food service and textile industries. increased risk of developing this disease. Previous studies have also found a relationship between pesticide exposure and neurological disorders, negative effects to the immune system, liver and kidney damage, respiratory ailments, infertility and cancers, including brain, lung, prostate and breast cancers. Children from conception to sexual maturity are most vulnerable to pesticides. The Environmental Health Committee of the Ontario College of Family Physicians report a higher incidence of leukemia, brain cancer and soft tissue sarcomas in children exposed to herbicides and insecticides. Emerging science has also linked a wide variety of health problems in children to their parent’s exposure to pesticides, including birth defects, premature birth, learning and behavioural problems. These latter effects were central to yet another recent study involving pesticides, this time conducted by U.S. anthropologist, Dr. Elizabeth Guillette. Guillette investigated the effects of pesticide exposure on preschool children from the Yaqui region of Mexico. The study had been prompted by earlier reports from the region of the high levels of multiple pesticides in newborns’ cord blood and in breast milk. It concluded, "Functionally, the exposed children demonstrated decreases in stamina, gross and fine eye-hand co-ordination, 30 minute memory and the ability to draw a person. "Videotaped sessions with the children also visually demonstrated the heart breaking effects of pesticide exposure. The Pest Control Products Act (PCPA) regulates pesticides in Canada. Passed in 1969, it has never been systematically revised. But the need to update the Act has been recognized and advocated for years. To this end, Marlene Jennings, a Liberal member of parliament for the Quebec riding of Notre-Dame-de-Grâce — Lachine, has recently introduced a Private Members’ Bill that prohibits use of pesticides for non-essential purposes. In effect, this bill shifts the burden of proof to producers by placing a moratorium on the cosmetic use of chemical pesticides in the home and garden and on all recreational facilities, until such time that scientific evidence showing use to be safe is presented to parliament and concurred by a parliamentary committee. Of particular interest to workers is another proposal to bring pesticides within the framework of the Workplace Hazardous Materials Information System (WHMIS), requiring all pesticides to meet WHMIS requirements, including those for labelling, and Material Safety Data Sheets (MSDS). Currently pesticides are exempt from WHMIS laws. Pressed by health, safety and environmental activists many Canadian municipalities are not waiting for other government jurisdictions. They have already moved to protect their workers, environments and citizens by passing bylaws to reduce or outright ban the use of pesticides for cosmetic purposes. Most are limited to uses on public property, but with the recent Supreme Court ruling upholding a municipality’s right to implement measures protecting the health of citizens, up to and including restrictions on private property, others are looking to broaden their approach. Choose grasses or other ground covers and plants that are well adapted to your general climate and that are suitable for the specific site. Regularly mow the lawn with sharp blades set as high as possible. Do not mow wet grass. For best results mow in evenings or on cloudy days. Leave grass clippings on the lawn. The mulch returns nutrients to the soil. If you are detoxifying a previously chemically-treated lawn, don't mulch for a year or two, thatch may build up. Water slowly and deeply about once a week. Avoid watering during strong sun or heat. Also avoid watering at night. The best time to water is early morning. Aeration fosters healthy grass growth and crowds out weeds by allowing air and water to penetrate through the thatch layer to the root zone. Aeration is best done in May/June and autumn. Organic fertilizer and/or top dressing helps maintain proper fertility and pH levels necessary to a healthy lawn. Use slow release, granular, organic fertilizer such as compost, manure, rock mineral fertilizer, bone and blood meal or kelp in autumn. To modify pH levels add lime or sulphur. Top dressing with compost is best done with aeration. Spread compost evenly no more than one-quarter inch thick. Over-seeding is another important strategy. You can attain excellent results by casting a mix of drought-tolerant, grub-resistant, grasses (i.e. perennial rye) with white clover. Ongoing monitoring and prompt treatment is also necessary. Remove occasional "weeds" by hand. Ants: Apply bone meal or diatomaceous earth at the burrow opening. Encircle the point of entry with a line of red chilli powder, paprika or dried peppermint leaves. Aphids: In a blender, mix garlic, green onions and half a teaspoon of Tabasco sauce. Strain and mix with soapy water. 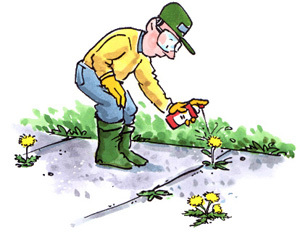 Spray the garden, wait a half an hour and rinse off affected plants. Slugs/snails/earwigs: Place a dish of stale beer in the garden. Insects will enter and drown. Grubs: Spray lawn with soapy water and turn over areas of sod infested with grubs allowing birds to eat them. Alternatively, apply nematodes, a natural predator of grubs, to the affected areas. Organic farming uses similar principles. Concerned about their health and the environment, larger numbers of consumers are turning to organically grown food. For similar reasons and to meet consumer demand, farmers are rediscovering more natural farming methods. Other practical considerations also come into play. Only about one per cent of a pesticide actually reaches its target. Many pesticides are losing their effectiveness as the bugs and plants they are designed to eliminate develop resistance. (Already 504 insect and mite species, 150 plant diseases, and 188 weed species have developed resistance.) Further, even though farmers have increased their usage of pesticides, they are still losing about 20 per cent of their crops to weeds and insects, the same proportion as they lost in 1930.
controlled use of pesticides, including cockroach glue traps. With food disposed of properly, desks and lockers cleaned nightly, unwanted books and papers recycled and dead plants removed, pest populations fell sharply and immediately — within six months. Last reported, pest sightings were virtually eliminated. Treatment for head lice also enjoys simple alternatives. While there are many pesticide-free shampoos on the market now, Dr. Moshe Ipp of Toronto’s Hospital for Sick Children recommends massaging in a 50:50 combination of mineral oil and vinegar. Cover with a shower cap. Wait one hour. And remove nits with a vinegar soaked comb. Wash with regular shampoo.